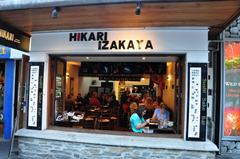 We were wandering around the adorable downtown in Queenstown looking for a place to eat dinner when we stumbled on Hikari Izakaya restaurant (5 Beach Street). 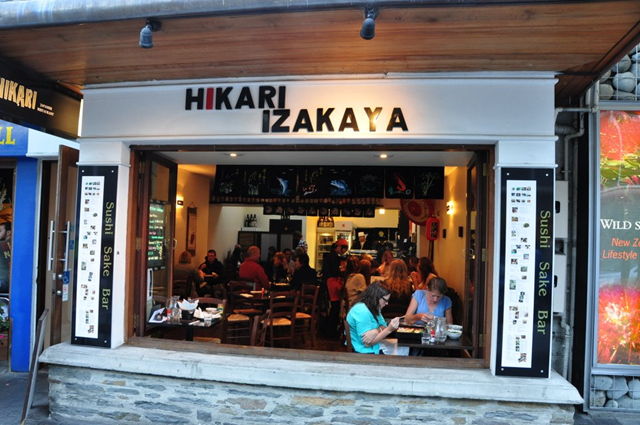 The windows open completely, so although there is no outside dining space, it does get you halfway there. amount of stir-fry vegetables with a delicate flavor. They were warm, not hot, but delicious. Ian had the Shabu Shabu, which is like Japanese fondue. 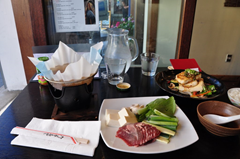 You cook your own beef, vegetables and tofu in boiling stock, $22NZD. The dipping sauce added a punch of sweet and salty flavor. shabu-shabu is terrific! love it in KL and also love it in winter in Tokyo when I visit for work. Sukiyaki is great too but I guess the shabu-shabu is less sweet;) I really like the fact that that window is ginormous.. looks like a cool place to hangout!